Many times people only think of weight lifting as building muscles and strength, but they don’t know one of the greatest benefits of consistent weight lifting is fat loss. Simply put, when you lift weights and eat a healthy diet, you will lose fat. The key is to combine your weight lifting exercises to create a metabolic effect. 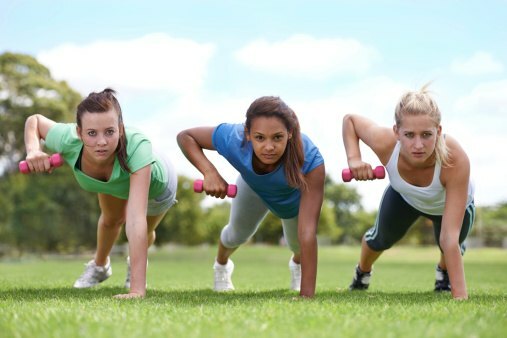 By doing compound strength training exercises, you will burn more calories during your workout and burn fat. Here are some of the most effective exercises for fat loss. Hold the dumbbells by your side and lower your body into a squat position. Make sure your knees stay in alignment with your ankles and that the majority of your weight is in your heels. You should be able to lift your toes. As you come up from the squat, curl the weights and then immediately press overhead into a shoulder press. Repeat this exercise 5-8 times. This exercise activates every muscle in your body and should elevate your heart rate. Remember to choose a weight that is challenging without compromising your form. Hold dumbbells by your side and perform a forward lunge. When you come up from the lunge, bring the dumbbells up into a bicep curl. Make sure to keep your core tight and avoid using momentum to swing the dumbbells. Use a challenging weight and make sure to breathe throughout the exercise. This exercise will not only activate your chest and back muscles, but will give you a nice cardio boost. Start in a push up position with your hands holding the dumbbells. Lower down into a push up and keep your core tight. If necessary, modify the push up by coming to your knees. At the top of the push up, do a one-arm row on the right and then on the left. Step your legs together and stand up tall. Repeat this exercise 8-10 times with a challenging weight. You should be sweating and breathing hard while your body burns fat and builds muscles. Step-ups will build strength in your glutes while burning fat and calories. Using a bench and a challenging set of dumbbells, stand in front of the bench and step up with your right leg. Keep your left leg extended behind you and then step down. Repeat that movement on the right side 8-10 times and then switch to your left side. The leg on the bench should be doing all the work. Don’t forget to breathe through the exercise as your heart rate elevates. This entry was tagged bicep, how to, lifting, lose weght, lunge, squats, step up, weights. Bookmark the permalink.